BIG GIRLS DON'T CRY...THEY GET EVEN. Every now and then I love a good bitchy book with drama and this one delivered! From the get-go we see that friendships are strained and not so peachy. Told from three points of view, Lilia, Kat, and Mary, life on Jar Island is anything but breezy. Lillia and Rennie are the schools Queen B's, but their relationship is more of a love/hate kind of thing. Lillia is tired of Rennie's selfish behavior and the way she treats the entire school. Kat was cast out of the cool kids club in middle school and that hurt is still very real. Mary left Jar Island and now she's back with a plan to get noticed by the one who broke her heart. We go back and forth between the three and soon enough, the three are in-cahoots to get what they want - revenge. Each girl has her own reasons for revenge and the mystery behind those reasons are slowly revealed throughout the story. The build up is paced well, and when Mary's reason for leaving Jar Island was unveiled, I literally felt sick. Han and Vivian didn't sugar coat that retelling and my heart just sank. I wanted to climb in the book and kick some tail myself! You might read a lot of reviews about this book and if you do you will hear, "What was that ending about?" or something along those lines. Yes, the ending is almost something out of the horror film Carrie and a little unpredictable. Personally, I loved it! I *almost* didn't see it coming and I think teen girl will be captivated. 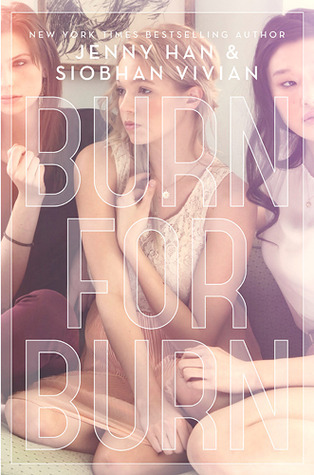 Burn For Burn is the new Pretty Little Liars....with a twist!